Ava.. er, I mean Ariel. Six months ago Ava and I were over at a friends house for a playdate. Ava’s friend is 1 year older and was very much into princesses. I remember thinking that Ava would never be into princesses. She loved bugs, worms, science, and tools! Boy was I wrong. Ava watched The Little Mermaid in January and she has been Ariel ever since. I have the honor of being Prince Eric and Scott gets to be King Triton. When Ava is Ariel the mermaid, she lays on the floor pulling herself around the house with her arms. When she is Ariel the human, she no longer has a voice, and she is just starting to get her balance on her legs. At the park she climbs up onto rocks and sings, she finds hiding places and calls them her secret grotto. I am amazed how long this has lasted. 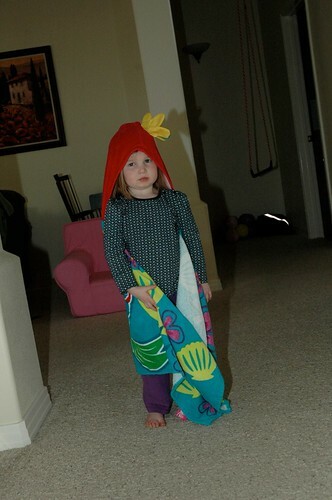 Pretending to be Ariel in her hooded Ariel towel. I have a video of Ava singing an Ariel song, so hopefully I can get it posted soon! So when you see Ava and you say “Hi Ava!”, the response you’ll most likely get is, “I’m not Ava!” After 3 months, we’re still having a hard time remembering her name. This entry was posted in Ava on March 25, 2010 by jenn. Jenn….I thought the same thing – Ava will never do the princess thing, she is so into how thing work, nature etc. just goes to show you how diversified our little girl is. Make believe is so much fun! 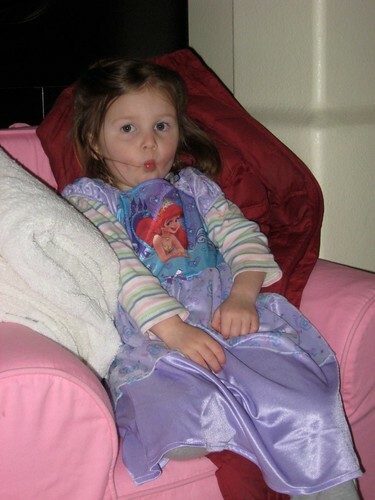 She is a perfect little Ariel…..and a perfect little Ava! Thanks for all the great posts. I love them so much!